Developers map out the world's most popular spots for walking, jogging, and cycling—and reveal where in this city Torontonians like, and don't like, to get outside and get active. 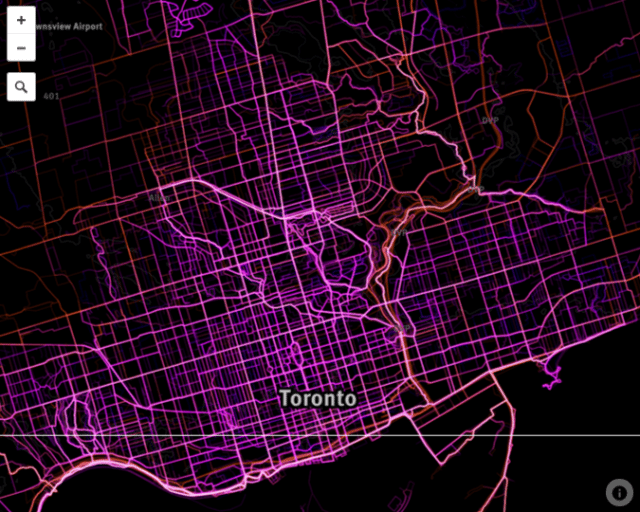 An overview of where RunKeeper users are active in Toronto. Map by Garrett Miller and Eric Fischer. A closer look at downtown. People really like cycling along the Don. Map by Garrett Miller and Eric Fischer. A detailed look at the downtown core. Map by Garrett Miller and Eric Fischer. Victoria Park Avenue is a dividing line of sorts. Immediately east there is a big dropoff in active transportation. Further proof that people really like to be active near water and green spaces. The Lake Shore is very popular, as in High Park and the Humber Valley. Map by Garrett Miller and Eric Fischer. A detailed look at Yonge and Eglinton. Map by Garrett Miller and Eric Fischer. If you made a New Year’s resolution to get outside and be active, you might wonder which are the most popular spots in Toronto for running or biking. Mapbox’s Garrett Miller and Eric Fischer have your answer. The developers collaborated on a snazzy-looking map that shows where the world’s cyclists and runners—including those in Toronto—like to go. Using data from RunKeeper, an app that allows runners and cyclists to track their trips and upload results, Miller and Fischer mapped more than 1.5 million trips from around the world. They cut off the first and last 200 metres of each one to anonymize individual routes, and the result is a resource featuring trails marked by various intensities of pink and orange. The pink routes are more likely to be walks or runs, while the orange routes are longer trips, more likely to have been taken by cyclists. Explore where people walk and run in Toronto with the pink routes, and where they cycle with the orange routes. Data is from RunKeeper. Map by Mapbox’s Garrett Miller and Eric Fischer. As CityLab points out, the maps highlight commonalities among cities. For instance, people love to run by water—whether along Lake Shore and Queen’s Quay in Toronto, or along the borders of Manhattan. Toronto’s map reveals that, in addition to being drawn to water, people—no surprise here—love to be active in green spaces. The data shows that the city’s extensive ravine system and its trails are very popular: Don Valley and Humber routes are coloured brightly on the map, showing they’re well travelled. Large downtown parks such as High Park, Queen’s Park, and Trinity-Bellwoods are also well used. The map also shows a correlation between an area’s built form and the likelihood that people will walk, run, or cycle. East York, North York east of the Allen, and the old city of Toronto are fairly well represented—the walkable downtown core is coloured bright pink. 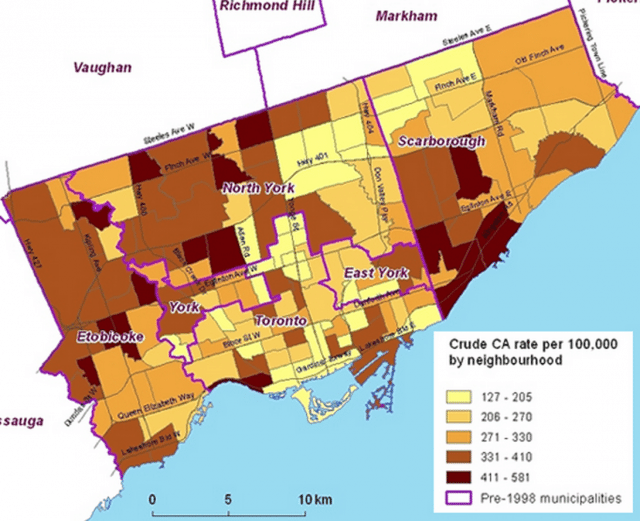 But Scarborough, York, and, to a lesser extent, Etobicoke show a relative lack of use. This could be because of RunKeeper’s data set, which might be produced largely by self-selected users from a younger demographic—but these areas of the city are certainly also more car-dependent and have lower Walk Scores. These kinds of data don’t just make for shiny maps—they can also support very real policy discussions about how to plan for and encourage more active transportation. A growing body of research suggests a link between walkability and positive health outcomes. City staff discussed how to build a healthier city by promoting walking and biking [PDF] in a series of 2012 reports [PDF]. 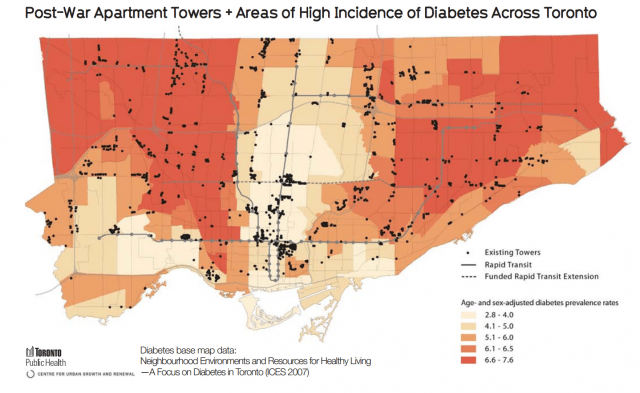 In fact, areas highlighted on Miller and Fischer’s walking, running, and cycling map of Toronto appear to be inversely correlated with those known to feature higher rates of diabetes. Taken from the 2012 City report Towards Healthier Neighbourhoods, this map shows the prevalence of diabetes across the city, with higher-intensity areas highlighted in red. The data are also suggestive in light of the conclusions of a 2012 University of Toronto study, which found that some neighbourhoods—including south and central Scarborough, North York west of Allen Road, north Etobicoke, and York—had up to five times more cardiac arrests than others. In a 2012 interview with the Globe and Mail, the lead author of the study noted that the rate of cardiac arrests increases as soon as you go east of Victoria Park Avenue: on Miller and Fischer’s map, we see a big drop-off in walking, running, and cycling east of Victoria Park. Map of cardiac arrest incidents across the city from a 2012 study by the University of Toronto’s Katherine Allan. Of course, there are many factors—income levels and the availability of transit, for example—that influence an area’s walkability and the health of its residents. Studies such as the 2011 Vertical Poverty Report by the United Way [PDF] and David Hulchanski’s famous Three Cities [PDF] examine data to produce a more nuanced look at the complex underlying issues. Miller and Fischer’s maps show pieces of a larger story. The most popular trails might seem simply like fun places for a run or merely the result of individual choices, but they’re part of a larger context that governs how the city works—how the built and natural environment, a community’s land-use mix, housing affordability, community health options, and other factors affect the way we relate to and use different parts of the city.